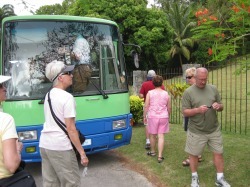 Eco Adventures scenic bus tours caters also to small groups, and include photo pauses and guided tour stops of Chalky Mount Pottery, a tropical forest reserve, a rugged coastal beach. 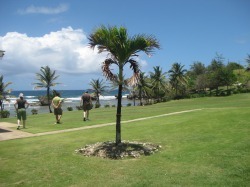 Our popular photo strolls are a hit with our guests, as they explore a bit, enjoying Barbados' fresh air, and taking in the fragrant aromas of the flowers in bloom. PHOTO PAUSE & MORE. . . Here our guests are at a stop break for photos, a guided coastal walk, and a rest room break. Our tour buses are air conditioned, for our guests' traveling comfort. 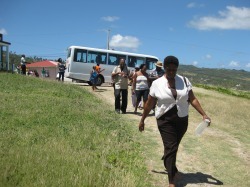 Knowledgeable,experienced and friendly tour guides are the order of the day for Eco Adventures. A picture perfect post card photo. Bathsheba, perhaps as equally alluring as the Biblical Bathsheba. This is deep countryside, in the heart of the SCOTLAND DISTRICT, so named because it reminded the British Settlers very much of the Scottish Highlands. 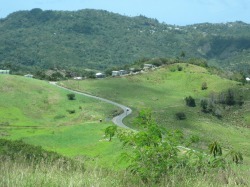 Book your group's 4 hour Heritage & Scenic Bus Tour, they are relaxing, comfortable, fun, entertaining, and can be custom designed to meet your group's interests.